- 【ACTIVITY TRACKER】: It records your steps, calories and distances in real time. You can set the daily step goal in the app, which will record the progress of your daily goal. - 【SMART RECORDER】: When the watch is connected to the phone Bluetooth. The watch can be used as an incoming call/SMS reminder. In addition, it can also be used as a message push reminder (Facebook, Twitter, Skype, Whatsapp etc.). 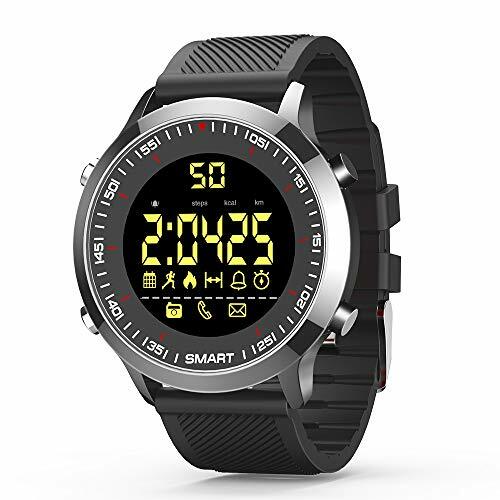 - 【OTHER FUNCTIONS】: Time & date, alarm clock, stopwatch, pedometer, remote camera, Bluetooth, luminous dial, adjustable strap, daily waterproof. - 【CONVENIENT AND DURABLE】: You can set the 12 hour/24 hour time format according to your own habits. Precision stainless steel dial, soft and sturdy silicone strap and long standby time (up to 6 months), you can wear it every day without worry. - 【WARRANTY AND SERVICE】: We provide life time technical support. Please feel free to contact us if you have any questions. We are sincerely here to service.